Analogue Addressable Fire Alarm Systems differ from conventional systems in a number of ways and certainly add more flexibility, intelligence, speed of identification and scope of control. For this reason Analogue Addressable Fire Alarm Systems are the natural choice for larger premises and more complex system requirements. 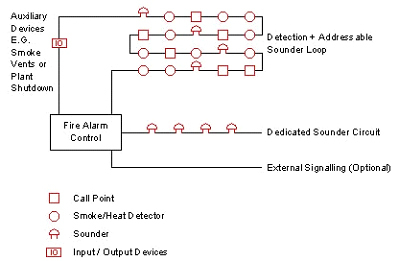 These systems consist of a central control panel to which smoke alarms and heat detectors are connected, along with bells or horns that are activated when the system triggers an alarm. The control panel operates from house power but also usually contains an emergency battery which can operate the system for about 24 hours during a power outage. Addressable panels are usually much more advanced than their conventional counterparts, with a higher degree of programming flexibility and single point detection. 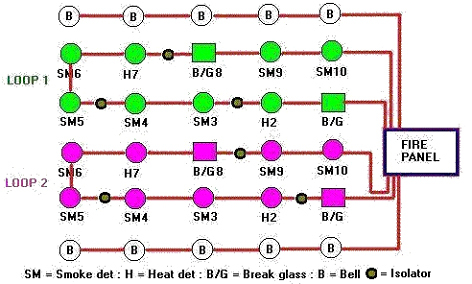 Panels usually have a number of signalling line circuit loops - usually referred to as loops. Depending on the protocol used, a loop can monitor and control several hundred devices. Each device on a SLC has its own address, and so the panel knows the state of each individual device connected to it. 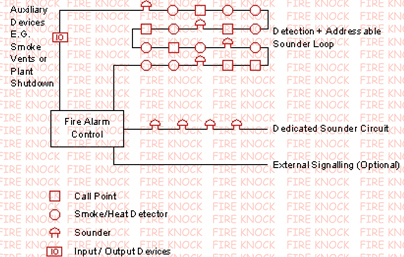 Common addressable input (initiating) devices include: Detectors, MCP’s, Warning System/Bell Relays, Activating fire suppression systems, etc. In an analogue addressable system detectors are wired in a loop around the building with each detector having its own unique 'address'. The system may contain one or more loops depending upon the size of the system and design requirements. The Fire Control Panel 'communicates' with each detector individually and receives a status report e.g. Healthy, In Alarm or In Fault etc. As each detector has an individual 'address' the fire alarm control panel is able to display/indicate the precise location of the device in question, which obviously helps speed the location of an incident. Sounders may either be conventionally wired or by using addressable sounders, wired upon the "loop" thereby making considerable savings in terms of cable and labour.